Tree View mode allows you to overview and interact with your content via the tree navigation. 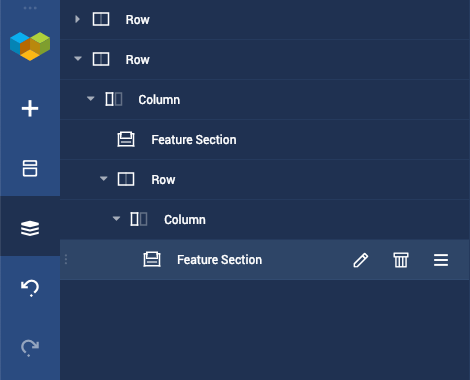 In the tree view mode, you will see a full structure of your layout in a compact way. It is also a way to edit your content via mobile devices. Tree View mode is available in the Frontend editor navigation bar. All of the changes you make in Tree View will also immediately take place in Frontend editor. To access Tree View, click on the Tree View icon in the navigation bar. In order to interact with a certain element, hover the element of your choice to uncover full element controls, including drag and drop option. Note: To reveal additional controls, hover the sandwich menu of the element in the Tree View.